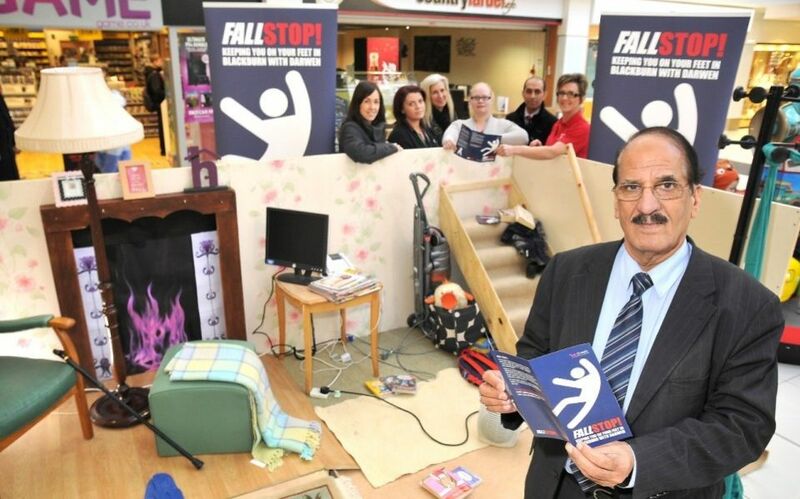 Cllr Mohammed Khan, Executive Member for Health and Adult Social Care, pictured at the Fallstop Challenge in The Mall, Blackburn. A pop-up living room designed to help demonstrate fall hazards in the home made its second appearance as part of Blackburn with Darwen Borough Council’s FALLSTOP campaign. The FALLSTOP campaign aims to raise awareness of simple steps people can take to stay on their feet and carry on doing the activities they enjoy as they get older. As part of the campaign, the FALLSTOP Challenge included a mock-up living room, set-up to include common fall hazards. It was set up in The Mall, Blackburn, and a week later at Darwen Market, where shoppers were invited to spot as many hazards as they could to be entered into a free prize draw. Full hints and tips on fall prevention are available in the Council leaflet “FALLSTOP: Keeping you on your feet in Blackburn with Darwen” available at www.refreshbwd.com/. For more information, contact the Council’s health and wellbeing advisers, who will be able to put you in touch with the service you need on 01254 682037 or email wellbeing@blackburn.gov.uk.